One month has passed with a speed which would make Einstein question the space time which surrounds the UK. 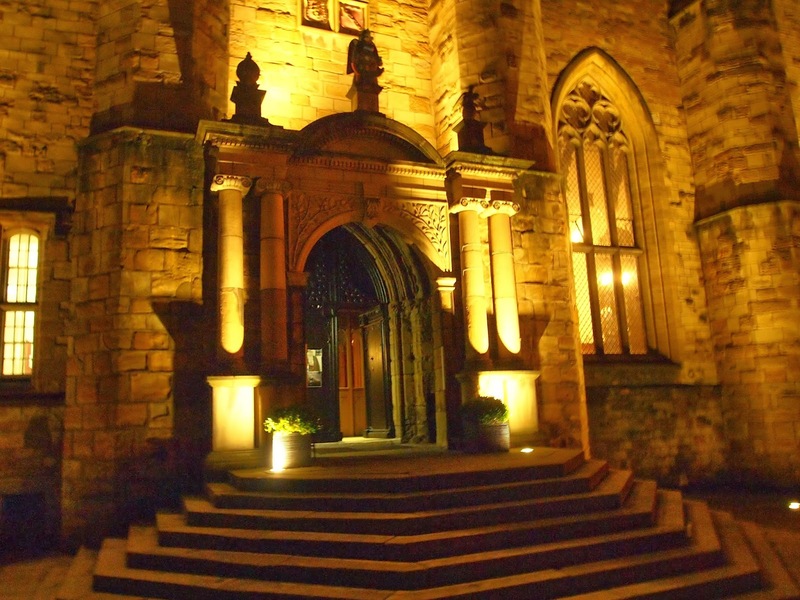 Friday marked the official one month mark and I celebrated it with an incredible dinner at the Castle. 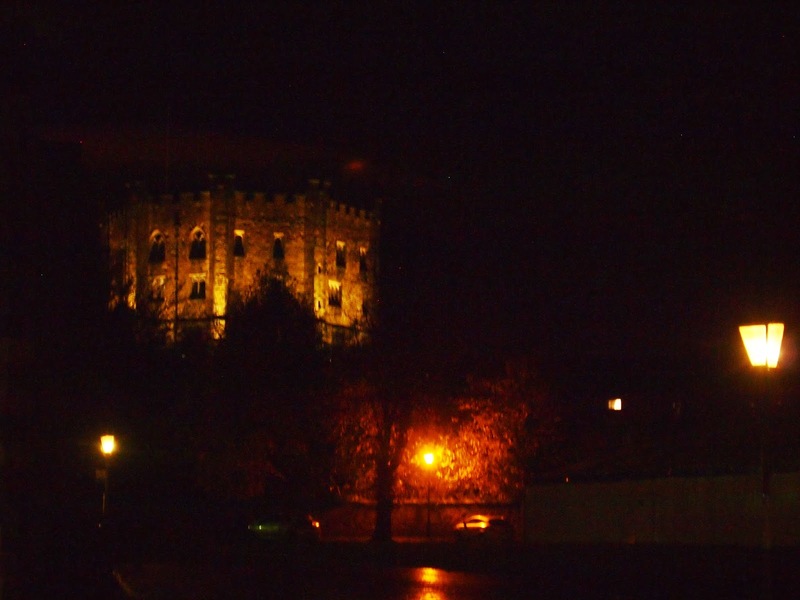 Normally the Castle is closed to everyone who is not a member of University College. 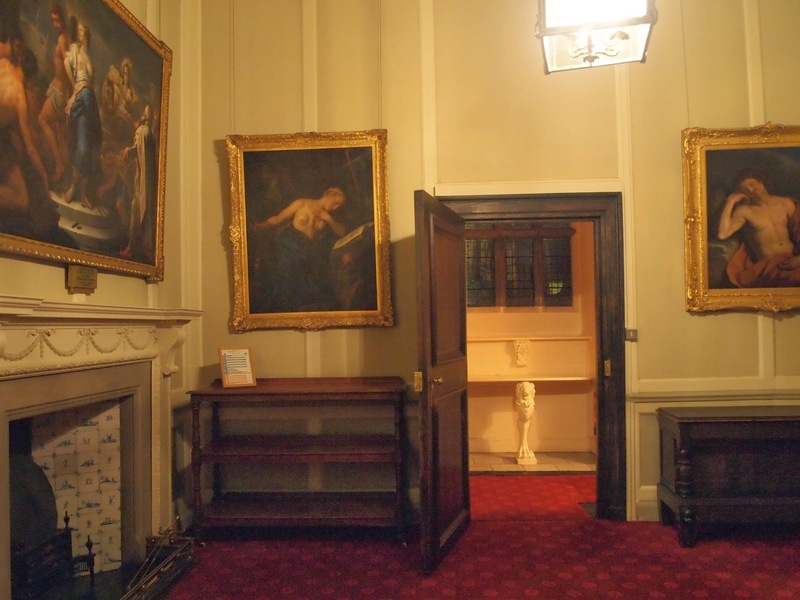 If you manage to get on a tour, you can pass through the large heavy wooden door and enter into, what really feels like another world entirely. 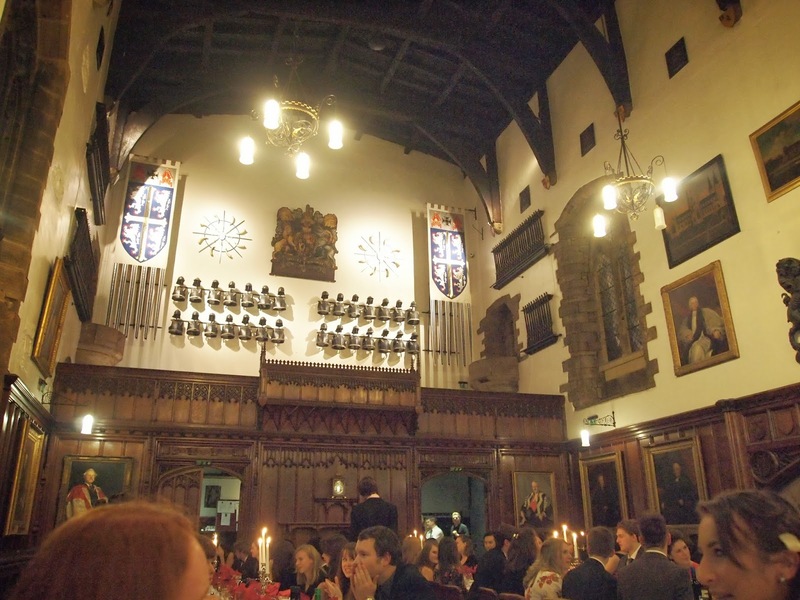 During Fresher’s Week, I joined the University’s Music Society, partly to pay homage to my past endeavors and partly because I knew they held at least one dinner in the Castle. The date happened to coincide with my one month anniversary of having arrived in Durham. I kept imagining what lay beyond the wall and heavy wooden door. Of course I had seen photographs, but they rarely give you the scale or the feel of actually being somewhere. Indeed, the Cathedral had been an utter shock to my senses despite the numerous times I had Googled it in the months leading up to my departure. I couldn’t get the idea of Hogwarts out of my head. 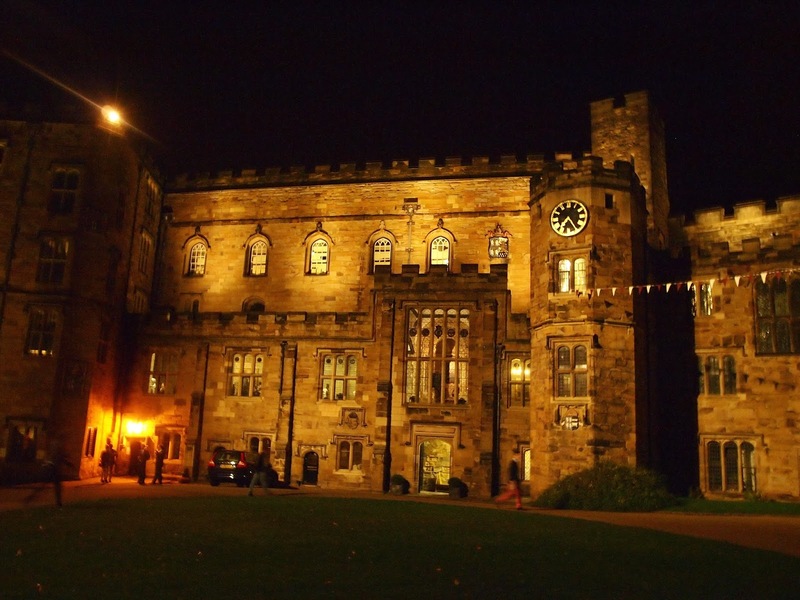 Perhaps it’s a very American perception that all of the old English universities are like Hogwarts, but I can’t quite get the comparison out of my head. 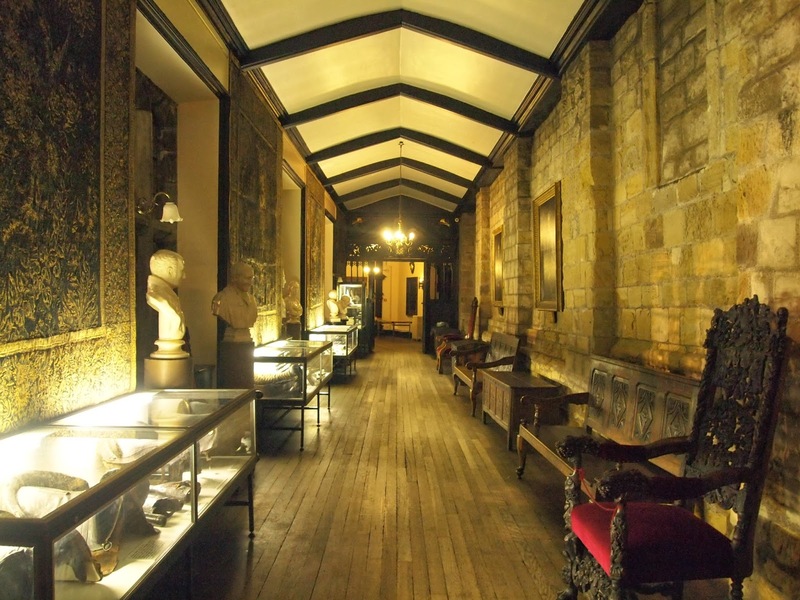 I imagined thick stone walls, tapestries, portraits, and stone floors that echoed with every step and tall, Gothic windows that glowed yellow at night from within. As the days passed, I gradually became more and more nervous. What if this dinner was a total disappointment? We had all built up the Castle in our imaginations as something incredible. What if it turned out to be quite ordinary? I received an email two days before. The dress code had changed from smart casual to smart. Instantly I had to rethink what I would wear. I was also informed I had to pick up my tickets from the World Heritage Site Center before it closed at 4:30 on the Friday. Luckily I was near Palace Green on Thursday afternoon and managed to collect them very easily. The day of the dinner Sophie, Charlie, Emily, and I met to review a quiz we were to take on calculating relative humidity. I handed Sophie her ticket. “I’m feeling quite nervous about this,” she said. “I hope so, too,” she said with a slight amount of concern. Time flew and before I knew it I was dressed in my black and red floral cocktail dress and walking over to Fisher House to meet Sophie. We began our trek down to the Castle. It was dark, but not as chilly as I thought it would be. I had wrapped myself up in a heavy winter coat and completed the ensemble with a scarf, gloves, and hat. I quickly removed the hat and gloves and put them in my handbag. It was a dark and slippery walk. The leaf paste was even more treacherous in heels and the lack of adequate street lighting made each step and leap of faith that the pavement would be solid beneath our feet. 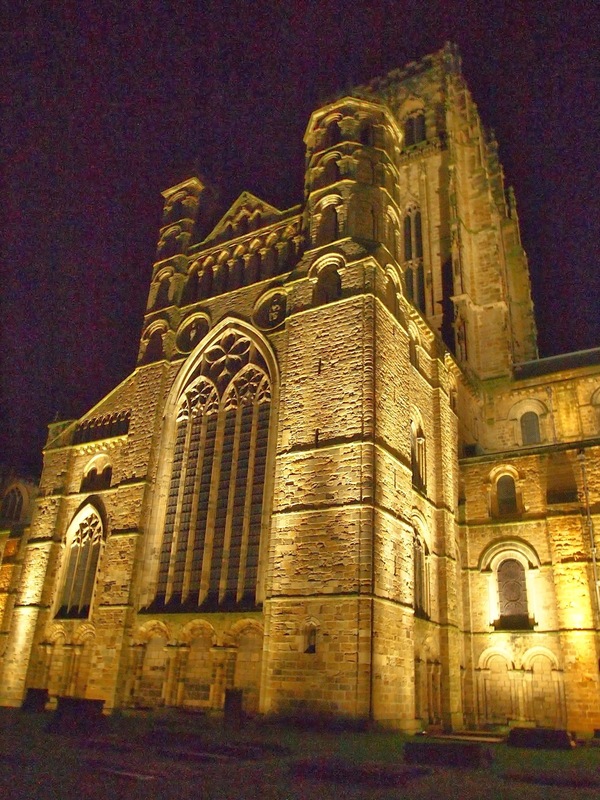 As we neared town, the Cathedral rose up out of the darkness. I hope that I never get used to seeing it. I hope that every time is like the first. That moment of awe and wonder that humans created something so substantial and imposing nearly a thousand years ago. However much we may look at them quaintly as simple people in a simpler time, you cannot deny that knew how to build things. We were finally at Palace Green. 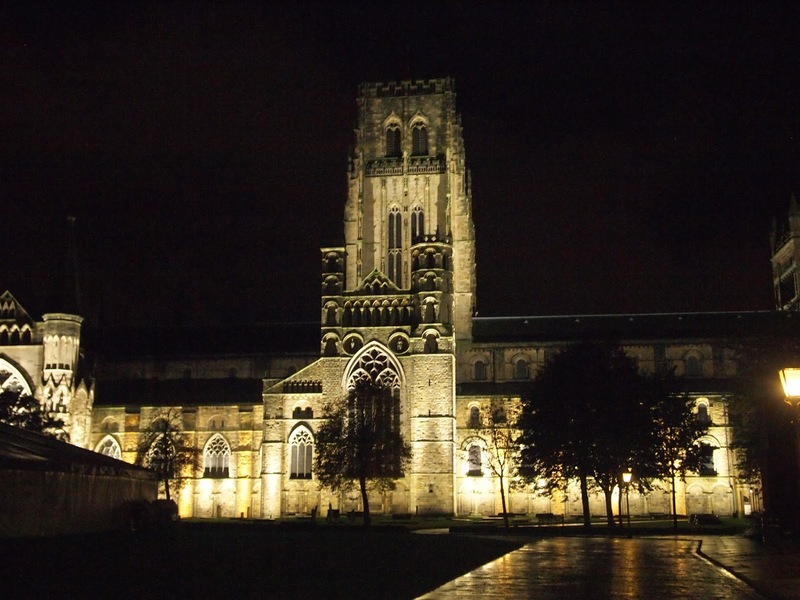 The only light was from the floodlights illuminating the Cathedral and the Castle. We found a bench where Sophie changed her shoes and we collected our thoughts. I was shaking with excitement and still nervousness. I knew I wouldn’t entirely fit in inside a Castle and indeed, I began to realize I had never before been inside a castle. We simply don’t have them in the US. 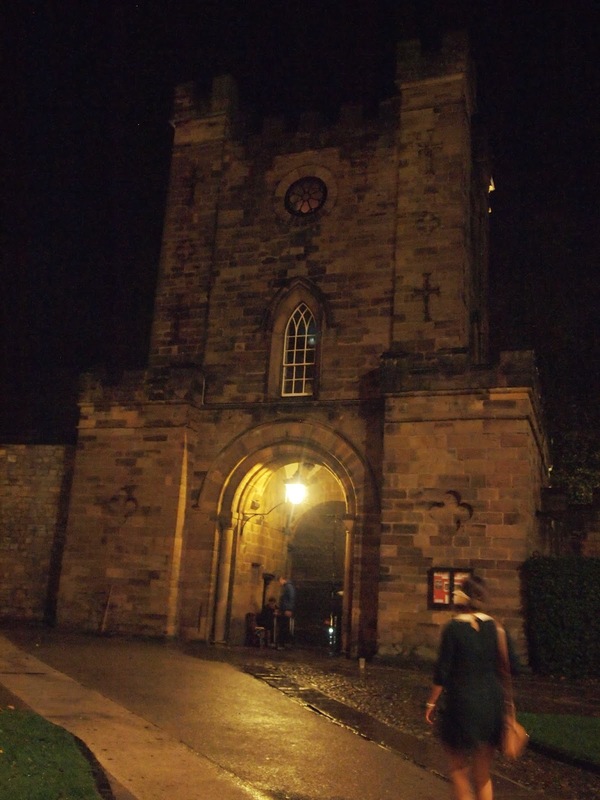 We crossed Palace Green, picking our way carefully over the cobblestones in our heels. The Castle loomed before us, but today, it couldn’t shut us out. We had our golden tickets and we would soon gain entry to the wonders that lay beyond that door. We arrived at the closed walkway and didn’t hesitate; we continued walking down the stone path towards the entrance. Then we reached the door. Now the door itself is quite huge, but because to move that door would be a genuine logistical nightmare, the good folks of the Castle had come up with a brilliant solution. They cut a smaller door in the larger door. Fantastic, you’re probably thinking, problem solved. Well when I say smaller, I mean it was probably three feet tall with a six inch lip at the bottom. Trying to squeeze through it in heels all while trying to look dignified is complete folly. It felt as though we were squeezing through the rabbit hole in Alice’s Adventures in Wonderland. I could only hope in that moment that it would really be a Wonderland on the other side. There was a small desk set out on the other side with a young man, the porter sitting at it. He pointed us to a corner in the courtyard where we were to enter. Our adventure with the tiny door had made both of us giddy. We finally decided that as we were here, and we knew we were imposters who had gained entrance to the palace for one night only, that we might as well make the most of it. We began taking photos of the courtyard with the frenzy of Japanese tourists in Manhattan all the while giggling to each other. Eventually we made our way over to the doorway the porter had pointed out and we were directed in and up a flight of stairs to the champagne reception. We took our coats and hung them in the entryway. We started up the wooden stairs and took a glass of champagne each. We had made it. We were in! Though the memory is fresh as I write, I find it difficult to adequately describe what it was like standing in that Norman castle, surrounded by stone and ornately carved wood. The corridor was filled with people all dressed in their versions of what smart meant. It was crowded and the voices of over a hundred people reverberated off of the ancient stone. We squeezed our way through the crowd and found ourselves near a display case filled with flintlocks and a leather saddle. DON’T put your wine glasses on the display case. “Looks alright,” she replied. We laughed again. It was then that we recognized a familiar face. Amanda from our department came over and we began talking about the previous week’s lectures, the relative humidity quiz, and our essay plans which were due on Monday. She told us that she had become distracted by a portrait of King Charles II which was hanging in the coat check room upstairs. 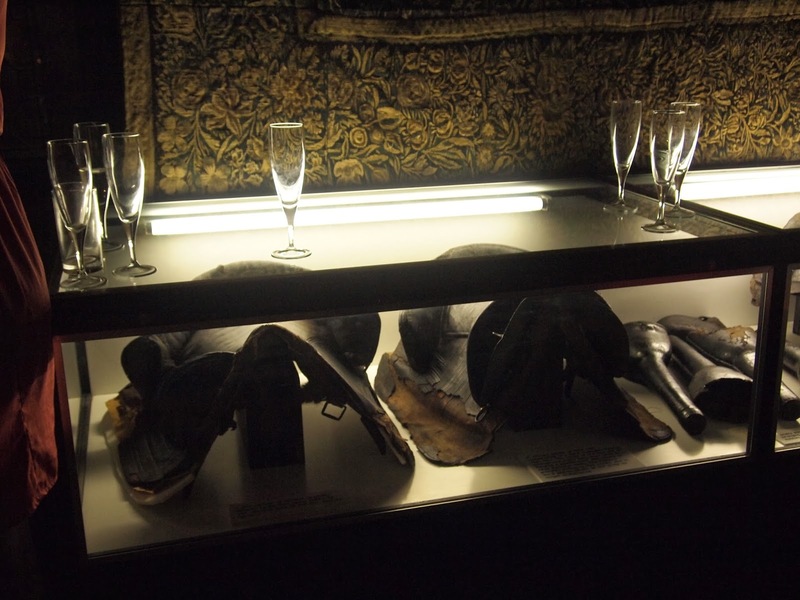 We made our way further down the crowded corridor and past more museum cases with leather pistol holders, which had looked to me like peg legs, and books. 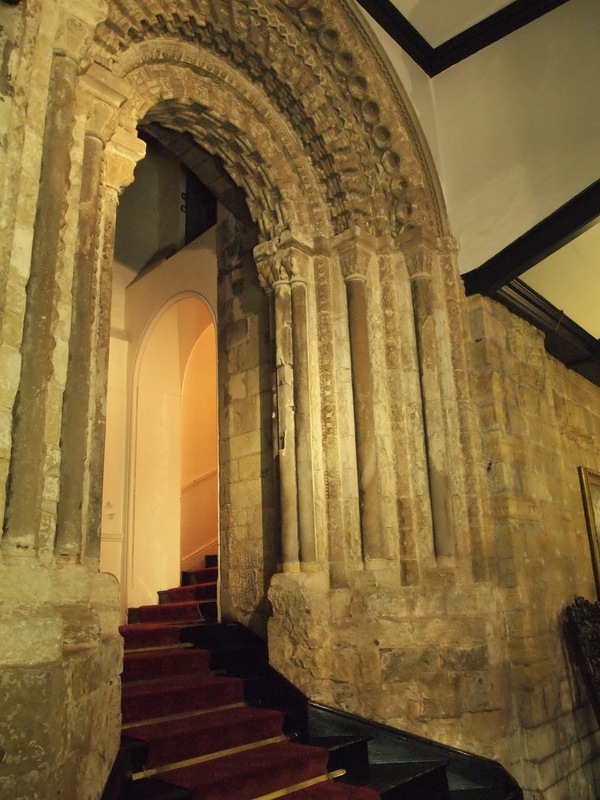 We were standing in front of a giant, richly carved stone archway with red carpeted stairs leading up to the second floor. Amanda went off to find a friend of hers while Sophie and I continued to blatantly take photographs and laugh about the fact we were actually there. “Should we go exploring?” she asked. My stomach began to knot up a bit. The last thing I wanted was to be banned from the Castle for being somewhere I shouldn’t be. On the other hand, when else would I have the opportunity? I nodded and we began to climb the red stairs. We turned to the right and went up some more stairs. On our left was an open door and we went in. A harpsichord stood in the alcove of a large window. Red curtains were swept up on either side. The walls were covered in paintings and these were not your hotel art types. These were legitimate works of art, painted by masters. They were simply here, here for us to view. Those students who lived in Castle probably got to see them every day. Do they just get used to this? It is all mundane to them? I wondered. There was a small room off to the left and we went in. The room was octagonal, with a coat rack standing on one wall and a round table in the center. It looked like the sort of room you see in movies used for séances. More paintings hung on every wall. 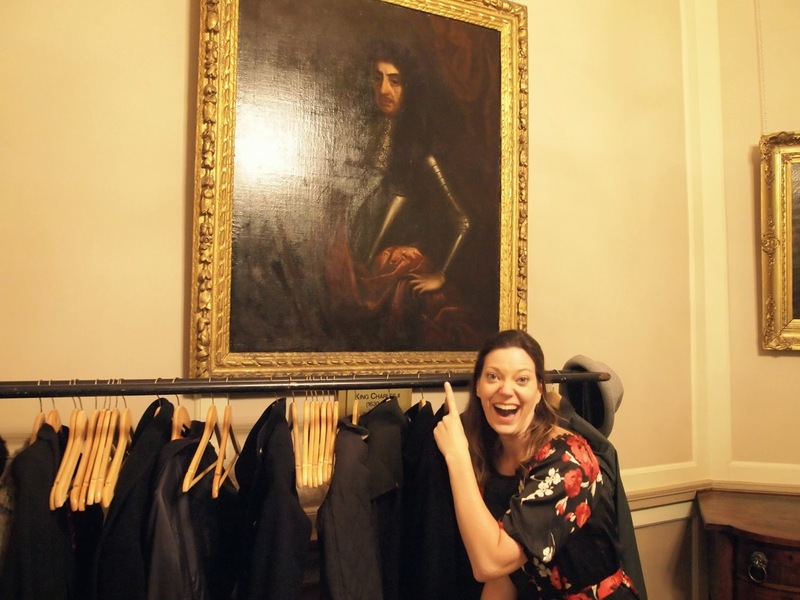 We found the portrait of King Charles II hanging just above the coat rack. Again I couldn’t believe it was just here. You know, we just have a painting of King Chuck II hanging in our dormitory, I thought. Like you do. We went out of the rooms and back into the tiny corridor by the stairs. Off to our left was a dark, spiral staircase. We began to walk up it but the darkness swallowed any chance of us seeing what lay at the top. We came back down and returned to the corridor just as the gong began to ring to tell us it was time for dinner. 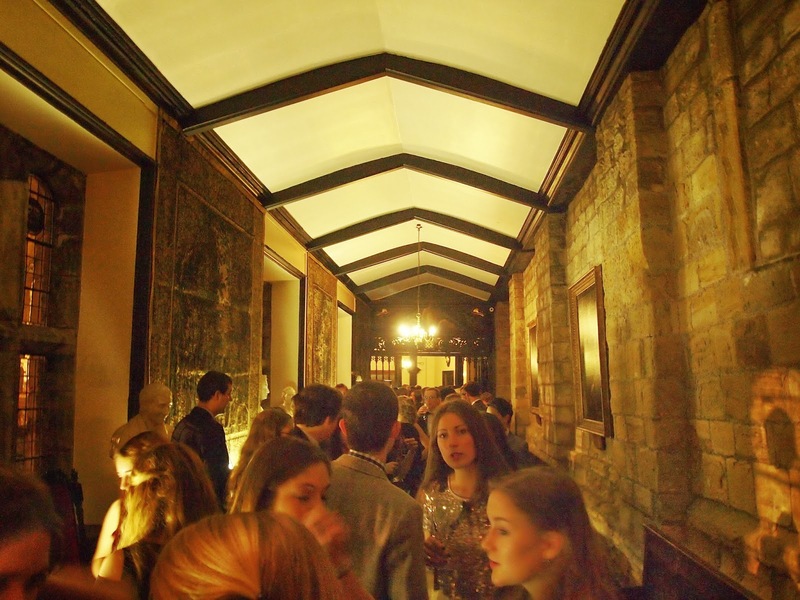 Everyone piled down the stairs and into the Great Hall. It was then that I realized, this wasHogwarts. The room was enormous. White plaster walls stretched up into the high vaulted wooden ceiling. More amazing paintings hung between the long stained glass windows and I kept expecting those sitting in them to get up and move. The minstrel’s’ gallery looked out on us and suits of armor and weaponry hung from the far wall. 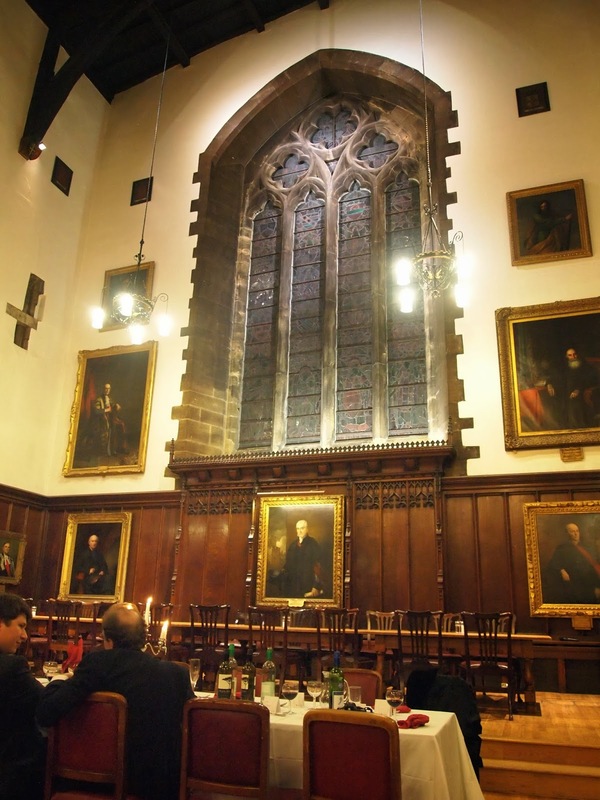 High table was empty but the wall behind was filled with the most beautiful window framed in gray stone. There were six long wooden tables set out three by two and everyone was hurrying around trying to find their places. Sophie and I were snapped out of our wonderment when we realized we had no idea where we sitting. We systematically walked up and down the tables until we found our places. We were separated slightly, probably owing to the fact that I had purchased the tickets only a week before. We sat and introduced ourselves to our table mates. Three were first years from St. Chad’s College. I was sitting opposite a third year who was also in the Archaeology Department and who happened to run the opera company. We chatted about my music degrees and singing experience and I wished I had the time to devote to learning a role while I was studying. Then came the speeches. The first speaker was a young man with dark brown hair. 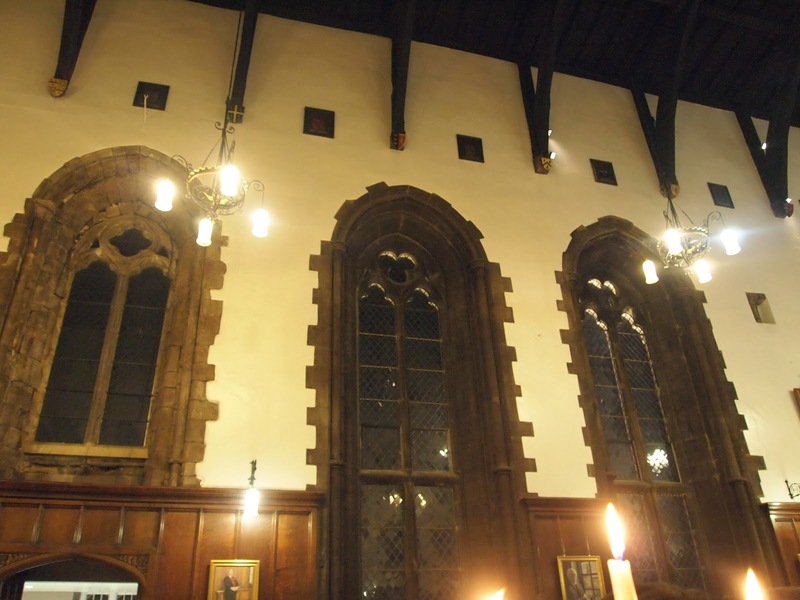 He informed us that we were sitting in a thirteenth century dining hall. I had never eaten anywhere that was remotely close to being 800 years old. There was a collective laugh from the people sitting at the far back of the room. He went on to welcome everyone and spoke about the Music Society. He next introduced the guest of honor, Ralph Allwood who had run a master class earlier that afternoon. He spoke of finding the one thing you love to do. Whatever it was, you should find that thing and do it. He also spoke of changing his program from physics to music when he was a brash nineteen year old. I thought of my own decision to go into music when I was seventeen. I had no idea if I really loved music at that point. What seventeen year old know what they want to do for the rest of their lives? He spoke about teaching children music and some of the more amusing anecdotes from his past. I had pangs of regret. I had made music the focus on my life for almost ten years and now I was doing something completely different. I had relegated it to a mere hobby and I began to wonder if that somehow made me less special. I looked around the table at some of the students who were in the music program and I envied them slightly. They would be embarking upon a wonderful journey. I thought of my undergraduate years and the amazing performances opportunities I had then. I smiled. Despite my change of career, I would always have those amazing memories. The run outs to New York to sing with the New York Philharmonic, the daily choir rehearsals (except Thursdays) working on the great masterpieces of Beethoven, Brahms, and Bernstein, those would always be with me no matter what my new course in life was. I was broken out of my reverie by applause. The speeches were over for now and it was time to eat. 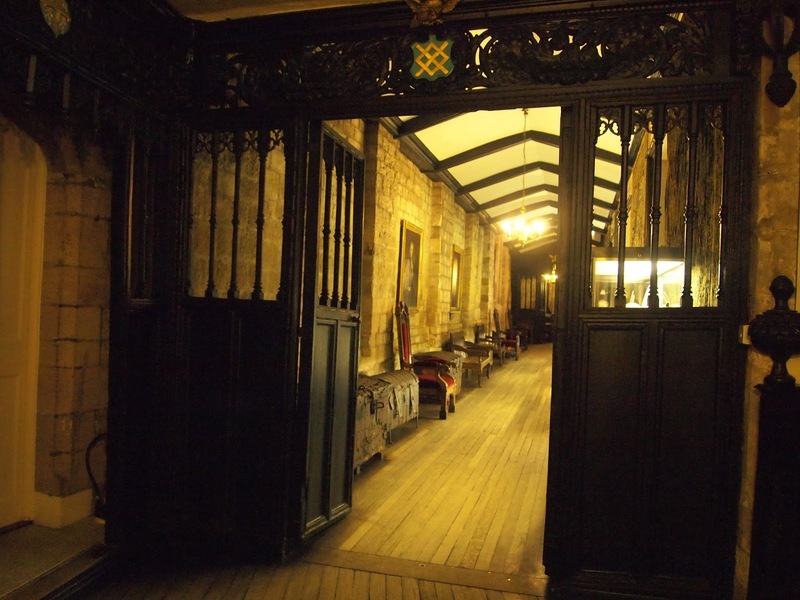 Each table stood in turn and went through the doors at the end of the hall under the minstrel’s gallery. This led around to the side of the Great Hall where we found a modern, buffet-style cafeteria. There was beef lasagna and garlic bread or a spicy Thai curry and rice. I opted for the meatless option and went on to the salad bar. We returned to our seats and began to eat our dinners. I couldn’t help continuing to gaze at my surroundings. I don’t think I would ever tire of eating somewhere this incredible. Castle students ate all three meals here. What must that even be like? I thought. How must it feel every morning to have your orange juice and scrambled eggs surrounded by such grandeur? I had another pang of regret. 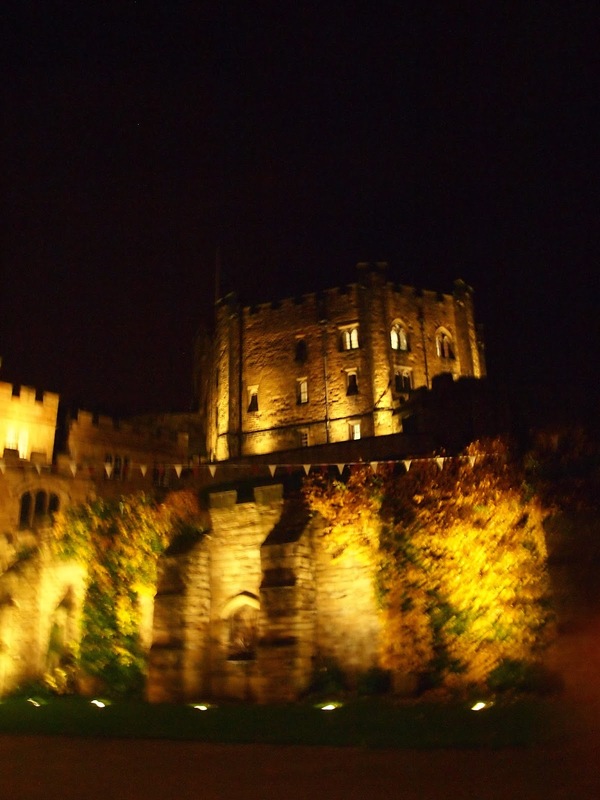 When I had chosen my college I had been torn between Castle and Ustinov. 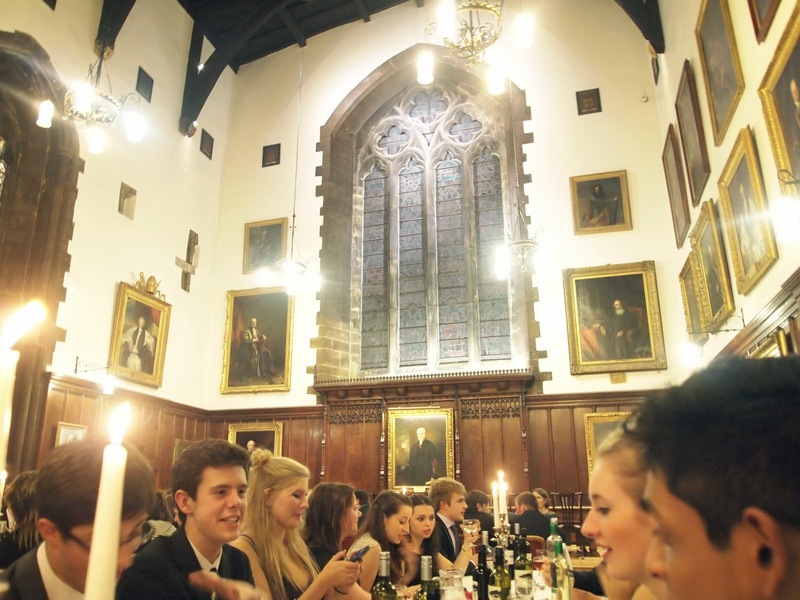 I had finally chosen the latter because I wanted to be surrounded by postgraduates and because Castle postgrads didn’t live in the Castle, but in accommodations further away. I began to wish I had the opportunity to walk in a Castle student’s shoes for just two weeks. It must be amazing. After the first course, the President of the Music Society spoke. I must admit I don’t remember much of what was said. We were to switch seats though in order to meet other people. All around me groaned. We had just begun to get to know each other. Sophie and I managed to find her new seat and I noticed the seat next to hers did not have a name tag. I planted myself there. Perhaps it wasn’t sporting, but I hadn’t had a chance to really talk to her all night. I felt that the emphasis of the evening should have been on the quality of meeting people not the quantity. Dessert was lemon cheesecake. Sophie, not liking cake, took the opportunity to find the restroom. When she returned she turned to me. 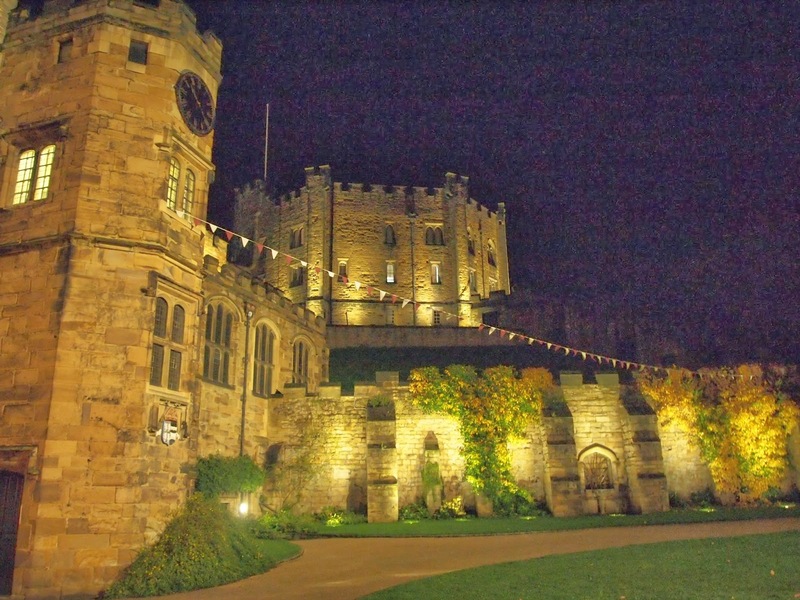 “Walking around the Castle, at night, on your own is a bit creepy,” she confided. She nodded. I smiled, I myself had to heed the call of nature and I looked forward to a quiet wander around. I had noticed that there was a bathroom off of the coat check room. 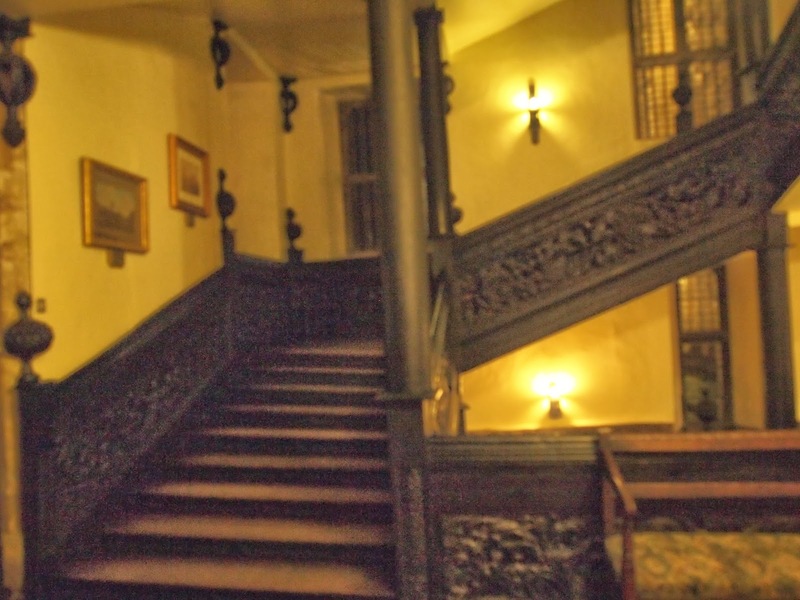 I made my way up the first flight of wooden stairs and into the corridor where the champagne reception had been. It felt quite a bit different now that it had been emptied of people. It was quiet and dark, save for the lights coming from the display cases. When you are on your own in a space, it somehow becomes more yours. You fill it with your own presence and it’s more comfortable. I walked slowly past the marble busts and iron artifacts. I turned left up the stone archway and climbed up the red stairs into the coat check room. It was still and quiet. I breathed more deeply now that I had a quiet moment to soak in my surroundings. I found the restroom and closed the door. I noticed a rather hideous floral curtain against one of the walls. I carefully pulled it to the side and found a deep, modern bathtub behind. I raised my eyebrow, confused. Then I thought, I wish I could have a nice long soak in a hot bath in a Castle. I decided that probably would get me chucked out for sure, so I just went about me business. As I was drying my hands, I noticed a key behind some glass surrounded by a red painted circle. 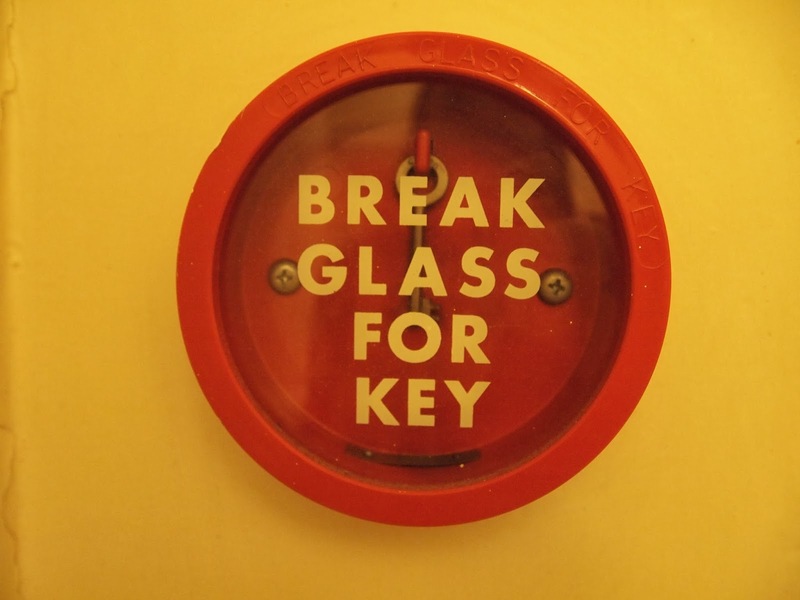 “Break Glass for Key” it read. I looked around. There was no explanation for what the key was or what it did. Once again, I allowed my imagination to take over. Clearly it was a key which unlocked a space time vortex and could transport whoever held it to anytime or place of the keymaster’s choosing. While a gallivant through the cosmos would be enlightening, I thought, I better get back. I returned to find Sophie sipping a glass of wine. “Sorry it took me so long, I was exploring a bit,” I explained. “I was wondering what happened to you,” she said. 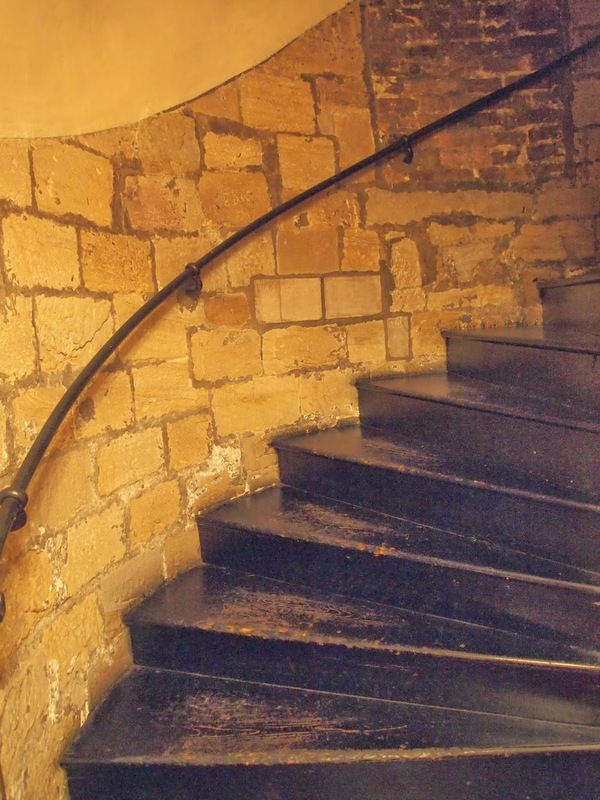 We decided to try to find the Undercroft, the University College pub. 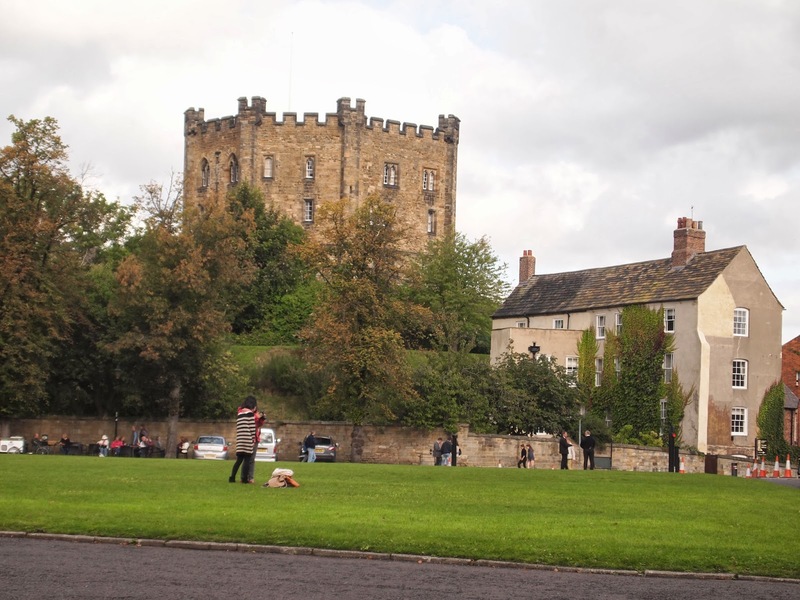 It was housed in an eleventh century portion of the Castle and I had been anxious to see what it was like. We collected our coats from downstairs and headed out into the courtyard. 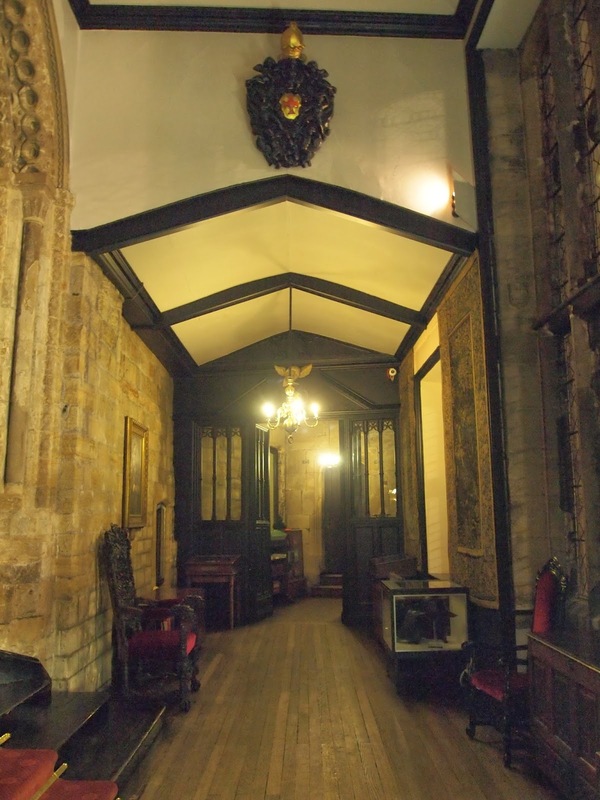 The pub was directly under the Great Hall and we entered hoping to find a cozy little pub dripping with history and intellect. Instead we found a college bar. I left disappointed. 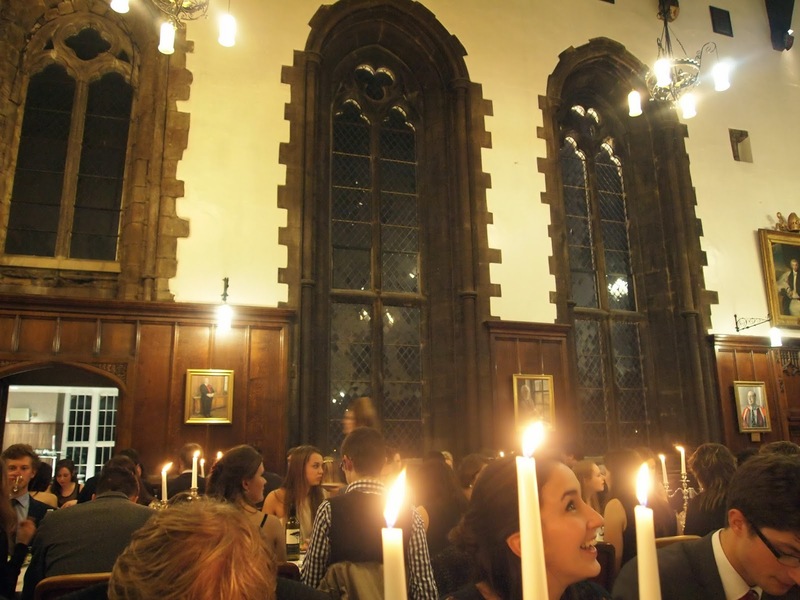 I had hoped for a level of ambiance to be present somewhere that was so old, but the hordes of undergraduates wearing Christmas stockings as hats killed it for me. We made our way back into the courtyard for one last look. It was time to crawl out of the rabbit hole. As I took in the last sites from within the Castle walls, I paused. It hadn’t been disappointing at all. It had been every bit as amazing as I had imagined and hoped it would be. I smiled and soaked in as much of it as I could before I squeezed through the tiny door and arrived back in reality. The only reason you liked choir at WCC was because you got to sing by me! 😉 I kept looking at your photos and thinking, “This reminds me of the castles I saw in Ireland. What a coincidence!” And then I was like….oh, right…they're pretty near each other…so that explains that. The pub at the end of the night reminds me of Princeton's U bar. I was so excited the first time I went to a bar on Princeton's campus and then when I got there I was not impressed at all. Well, at least the castle/dinner didn't disappoint!